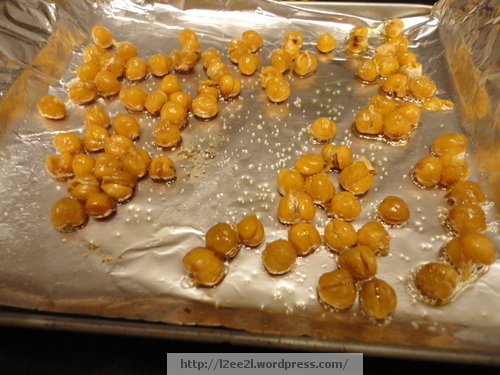 I came across oven roasted chick peas on the internet a while ago. I couldn’t wrap my mind around the process, making a crispy snack out of something I perceived as “squishy”. This weekend, the concept finally hit me. There’s a Japanese snack of crispy wasabi peas. I figured, if that’s possible, I’d give it a shot. Opened a can of chick peas and rinsed them. Dried them on paper towels, tossed them on a pan with bacon fat. The original recipe call for olive oil, but you know me, if I can get bacon involved … Hee hee. Set the toaster oven for half an hour and voila! A little sprinkle of salt after the chick peas were done. The Cat approved. The only drawback is that they have to be eaten fresh (like that’s a problem). What a wonderful and tasty snack! Thanks! Pretty easy too. If I can successfully do it … anyone can. What a great, healthy snack idea and easy too – I’ll definitely be trying it. Bacon fat is always healthy (in moderation). Heh heh.